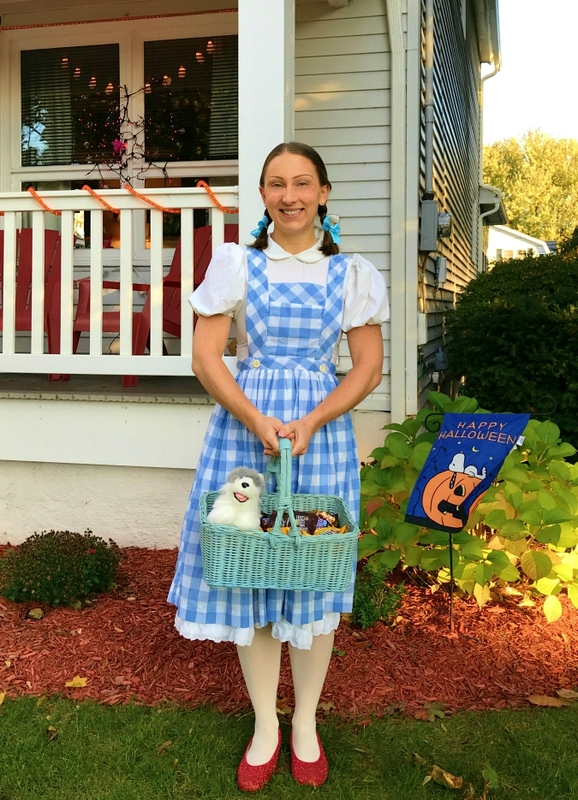 oh my goodness, last night was a great halloween!!! i felt like a little kid all night. unfortunately, ryan had to work and miss trick-or-treat, but my dad came up to join me. 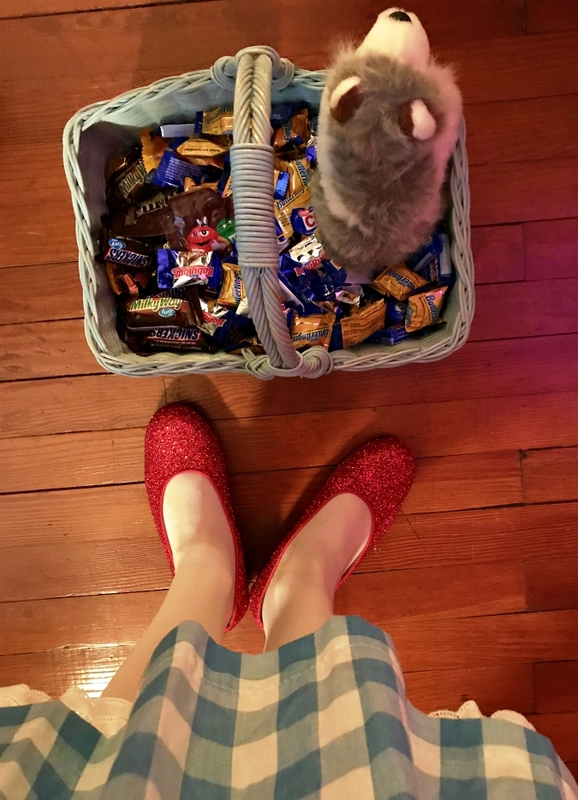 as soon as i got home from work, i got into costume as dorothy from the wizard of oz. this costume was one that my great aunt hand made for me when i was somewhere in middle school. it has always been one of my favorites. i re-wore it one year in high school and was glad it still fit so that i could re-wear it again this year. 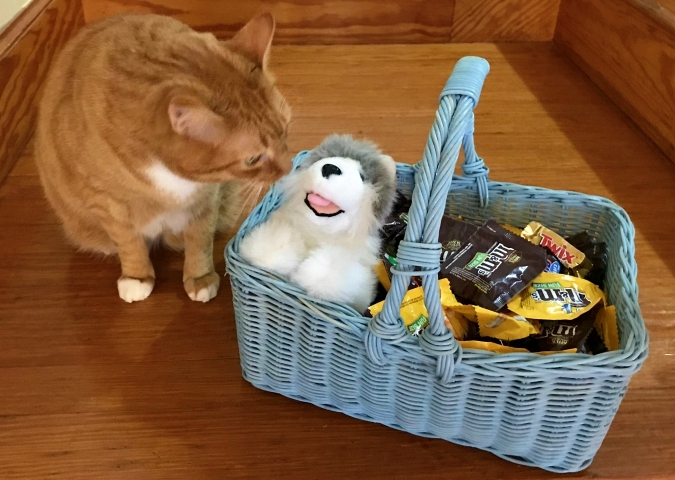 my mom found the stuffed dog to put in my basket as toto and boy was that a huge hit! 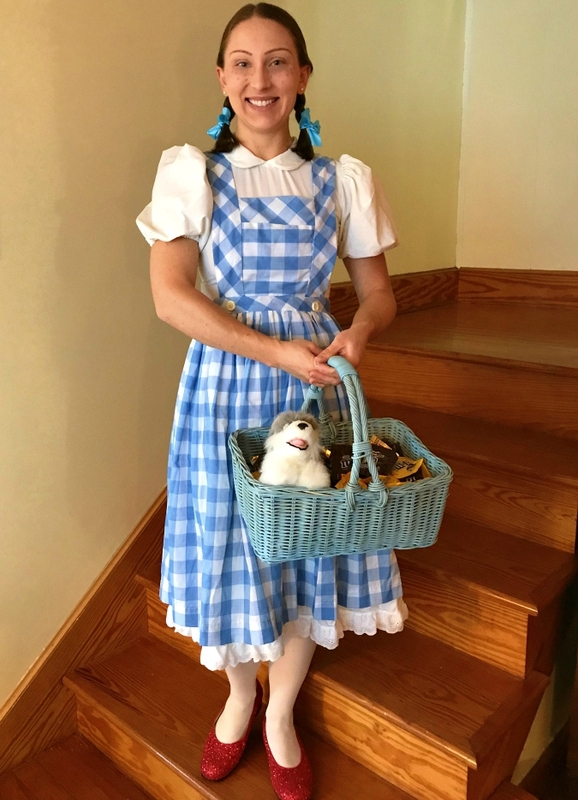 all of the kids kept asking if they could pet toto! it was really cute. 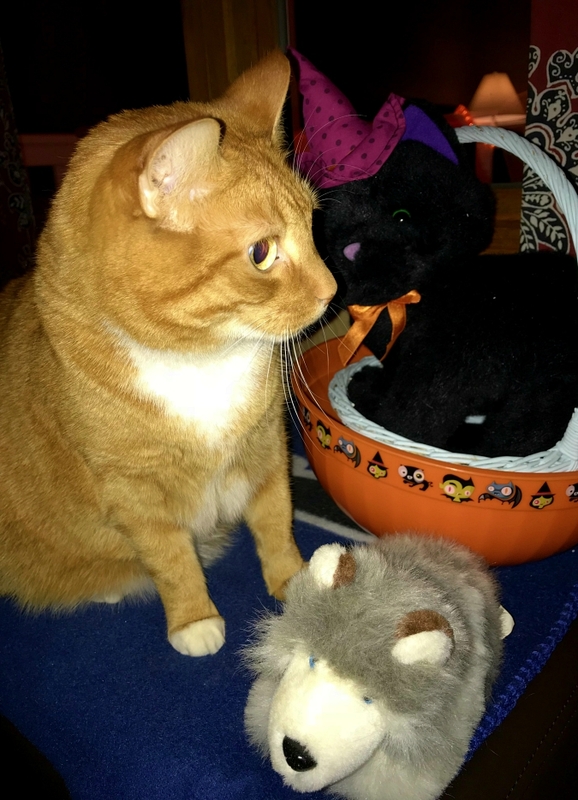 two separate trick-or-treaters even took toto out of my basket and put him in their candy bags! luckily i got him back each time. 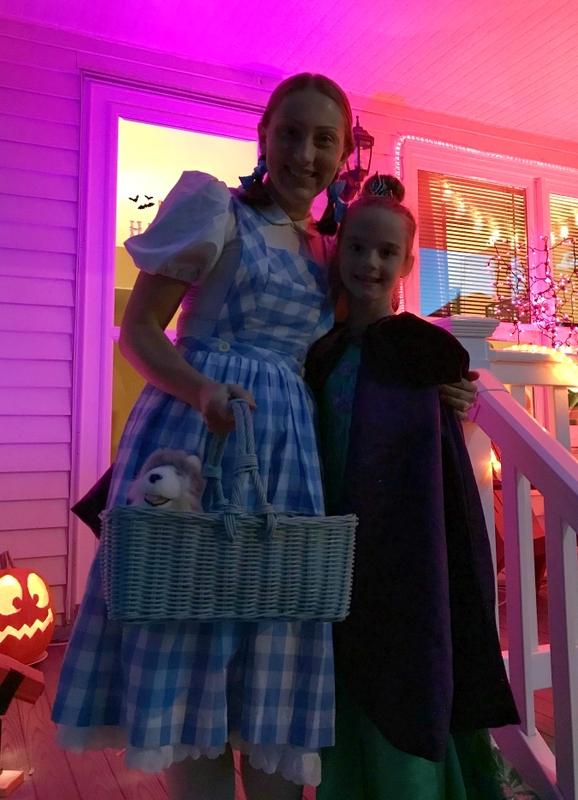 i was happy that several of my dance students who live near me came to my house to trick-or-treat. it was cute to hear them yell "it's miss laurie!" when they realized it was me. there were a lot of great costumes, but my favorite for the night was a giant inflatable t-rex costume. it was pretty impressive! here are some photos from our halloween last night . . .
Wow looks like a lot of fun. Glad dad got to share it with you. Next year I think I will take off from work and join you. Love how the house was decorate with the lighting and of course you look authentic. Leko is cute by the basket with the black cat. Maybe he wants a friend. Fabulous night. Dad really enjoyed himself. You two were both kids again. I love that costume - so pretty! I also like your dad's sweatshirt. It looks like Leko was wondering about that puppy in the basket! Halloween is still fun. We only had about 29 kids, but most were polite. I wish there were more places like this, because it was simply too amazing for words. I came here with my boyfriend the other night, and it was absolutely fabulous. The use of wood throughout the NYC venues adds a very warm and inviting feel to venue.